Free decorating ideas for decorating with neutrals: Here's a free e-book that shows you how to use simple color tricks to create great rooms. Obviously, this site contains nothing but free decorating ideas and color advice, but this is the first of my free home decorating books! I often get requests for free home decorating ideas and tips, and there's a large section of color questions on this site where you can submit your room photos and get an illustrated reply. However, it's obvious that just handing out free decorating ideas doesn't provide what people really need. What most people really want is more knowledge and confidence in choosing color schemes for their homes. I couldn't get enough and wanted to go on reading. Thank you Renate! That's why I've put together a small, free home decorating book full of essential color decorating know-how. The most popular paint colors in the Western world are neutrals. Many interior designers create extremely versatile, chic and inspiring rooms on a simple base of neutral colors. Browse through interior decorating magazines, and you will find that almost every interior color scheme consists of at least some neutral colors, with a few "real" colors added into the mix. 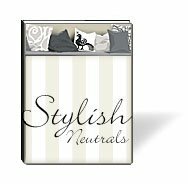 So if you're looking for free decorating ideas that will help you create great color schemes yourself - without professional help - then Stylish Neutrals is one of the most useful free home decorating books to get your hands on. Thank you, thank you, thank you - neutrals make a whole lot more sense now. 4. Neutrals plus color: Three successful examples of neutral color palettes with added color. Together with your free home decorating book, you will receive a free subscription to Dream Home News, my e-zine brimful of even more free decorating ideas, delivered directly to your e-mail inbox every two months. After completing the form below, you will receive an email asking you to confirm the address given. This is to make sure someone else did not submit your e-mail address without your knowledge. Upon confirmation, you will receive a link to download the e-book. Return from Free Decorating Ideas & Free Home Decorating Books to the Dream Home Decorating homepage.